Submitted by: Beth Love, former art teacher at Waynesboro Primary School in Waynesboro, Georgia. Grade level: I did this with K-2 (Ages 5 - 8), but it could be used with any age. 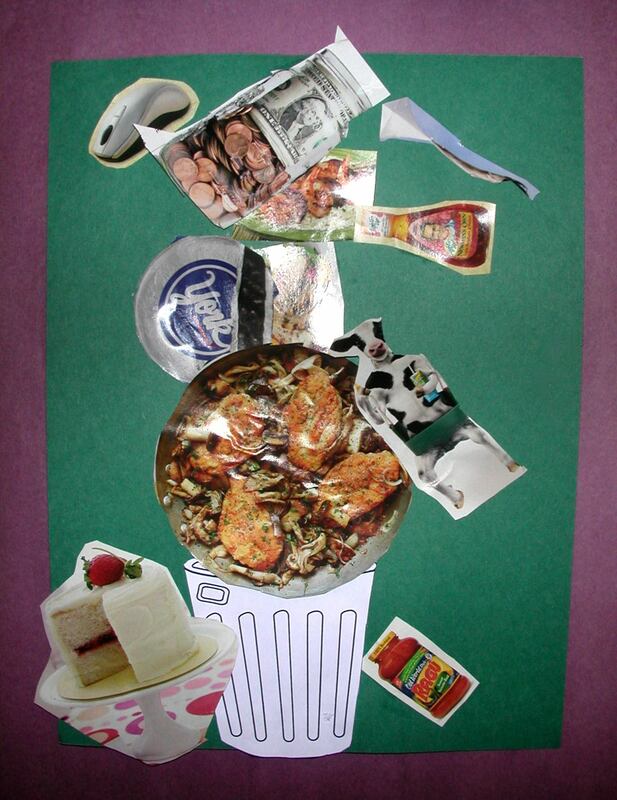 Students will explore ideas of silly things that might be found in the trash. Create an illustration of their ideas using found materials. Poem by Shel Silverstein, "Sarah Cynthia Sylvia Stout Would not Take the Garbage Out," Construction Paper , White Glue (I put school glue mixed with a little water in spill-proof paint cups with cheap Paint Brushes . This is easier for the little ones to use without squeezing a whole bottle of glue onto each magazine scrap), Magazines, Scissors , and Garbage can cutout. Read the poem "Sarah Cynthia Silvia Stout Would not take the Garbage Out" by Shel Silverstein. Discuss the silly things that Silverstein described in Sarah Stout's trash. Talk about what kind of illustration might accompany this poem. 2. 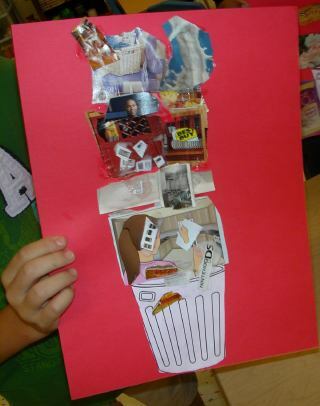 Cut out and glue items from magazines to your "trash pile" above the trash can. Because the poem is meant to be silly, I encourage the students to find and add unusual things to their trash. Students should be able to use materials according to directions given. Students should be able to use creativity to add silly objects to their collage. Understanding and applying media, techniques, and processes. Students understand and use similarities and differences between characteristics of the visual arts and other arts disciplines. Mp3: The Best Of Shel Silverstein - This includes "Sarah Cynthia Sylvia Stout Would Not Take the Garbage Out" and 25 other songs by Shel Silverstein. You can also order just that song for $.99. You can also buy the CD. Books: Where the Sidewalk Ends (25th Anniversary Edition Book & CD) - This book includes many poems that allow children to envision fun things. Students could draw or paint pictures from what they visualize after reading the poems. Shel Silverstein: Poems and Drawings: 3-Book Box Set - Shel Silverstein's three best-selling, beloved poetry collections -- Where the Sidewalk Ends, A Light in the Attic, and Falling Up.